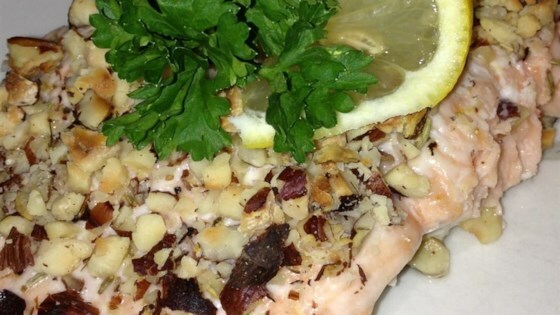 "Hazelnuts, lemon, and rosemary are a delightful complement to salmon in this easy recipe." Preheat oven to 400 degrees F (200 degrees C). Coat a baking sheet with cooking spray. Place salmon on prepared baking sheet. Whisk mayonnaise and lemon juice together in a bowl until smooth; spread mixture onto salmon. Sprinkle each fillet with rosemary, salt, and black pepper. Top each piece with hazelnuts. Bake in the preheated oven until the fish flakes easily with a fork, about 15 minutes. A simple and delicious way to make fresh flavorful salmon in the oven.